It was a sight to see! Forty enthusiastic Y Striders who were very happy to spend a mild Sunday afternoon completing the annual Twilight Walk. We really felt summer was around the corner when we met in the car park near Burswood at 5pm last Sunday. The weather was warm, the sun about to set and city skyline striking. 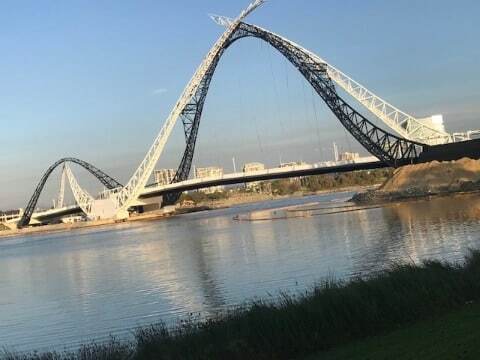 Many of us hadn’t been to this part of the river foreshore since the East Perth redevelopment. 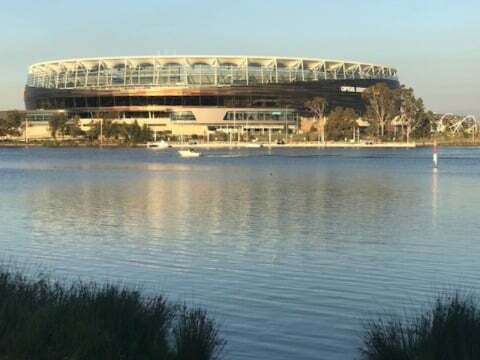 It was a real eye opener and a pleasure to see so many families enjoying picnics in the parks and children’s playgrounds at Optus Stadium. There is one group of Y Striders who are very familiar with part of the city. The Striders Riders, led by Bill, bike ride of a Friday morning. They often ride from Deep Water Point up around the new parks and across to East Perth, where they stop for coffee before riding back. By then, the Camfield Hotel was in sight and as it was a warm evening, most were keen for the opportunity to get inside. Cool drinks and generously portioned meals were quickly ordered and consumed. 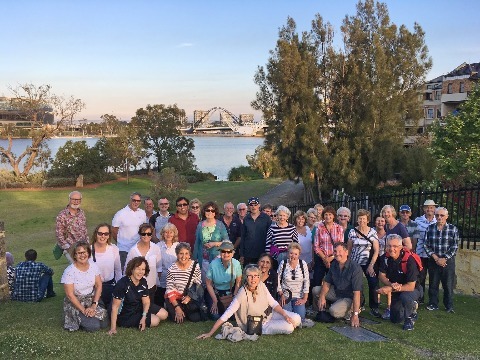 It was delightful to sit with the Matagarup Bridge in view, watch the sun go down and enjoy the company of like-minded Y Striders. Everyone enjoyed the evening so much that we are already looking forward to our next excursion – a Christmas lights trail. As always, our very social and lively club members were able to combine exercise and relaxation in one outing. Many thanks to our social coordinator Ann for organising this enjoyable evening.